A leather cuff bracelet for men with an adjustable buckle! Bracelet measures approximately 1 5/8” wide. Hand crafted from long lasting high quality leather! Made in Co. Cork, Ireland by Lee River Leather Goods. This handsome leather Irish bracelet for men is comfortable enough for everyday wear but stylish enough to dress up any outfit. This leather bracelet measures approximately 1 " wide. 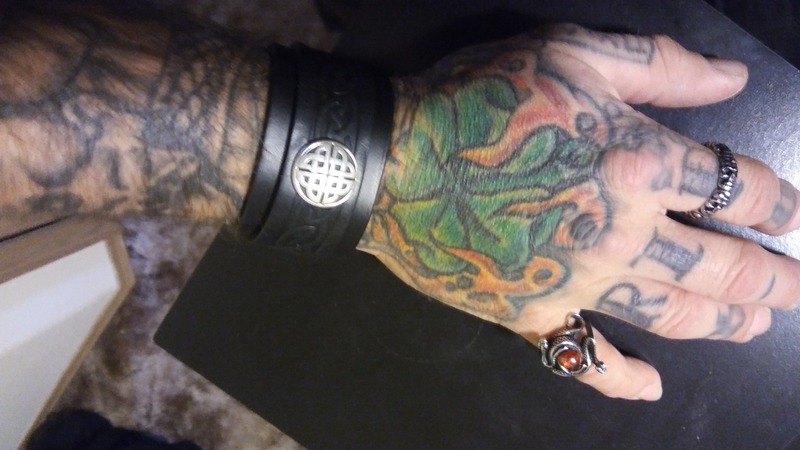 The cuff features a Celtic knot design around the middle, slightly raised for a layered look, and another Celtic knot on a pewter medallion in the middle. The leather bracelet is sure to make the wearer feel cool, confident, and very Celtic! The Irish bracelet is designed with an adjustable buckle, and can fit wrists from 7 1/2" to a 9" in circumference. The leather bracelet is made from genuine leather and uses a vegetable tanning process that takes natural ingredients such as the bark of chestnut trees creating a long lasting leather bracelet. This buckle bracelet for men is made by Lee River Leather Goods in Co. Cork, Ireland, a shop that specializes in creating durable Irish leather gifts. This Irish bracelet makes a perfect gift for the Irish man in your life! Got this as a gift for my son....he loved it Very good quality materials ! I purchased these items as a Christmas gift. They are high quality and very attractive pieces. The were delivered quickly. This was the second time I ordered merchandise from your company and it definitely will not be my last. I am very very happy with your company. Thank you and Merry Christmas. I was very exciting to learn about you, see the wide range of what I believe are authentic Irish goods, and be able to purchase one of your bracelets for a special gift I'll make. I was very pleased with the thorough amount of information found in your webpage which explains the intricacies of Irish symbols and the rich Celtic tradition. I am not Irish (not even close) but I am very interested in the Irish culture and especially on its Celtic roots, traditions, language (gaelic) and spirituality. Your site seems to speak to all of these interests of mine and your service was excellent! I am sure my gift recipient will love it. Thank you!